It's September...and you all know what that means, right? Back to school time!!! Where I live, school starts for elementary, middle, high school, and some colleges after labor day. To, well celebrate isn't the word, so commemorate back to school, I decided it was appropriate to do some nail art! I wasn't really sure what I wanted to do when I sat down to paint my nails. I started to think about all the different aspects regarding school. Chalkboards, paper, notebooks, markers, pens, pencils, desks, math problems, science experiments, buses, oh the list goes on and on. cutepolish posted a cute nail art tutorial which featured apples for one of her back to school manicures, but I wasn't really feeling it. 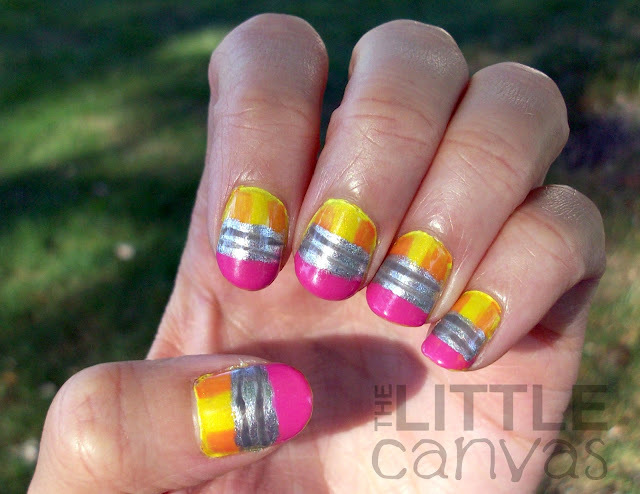 Then I remembered an awesome manicure I saw on The Daily Nail which was an awesome #2 Pencil Nail art. I headed on over to her blog and found that she made a handy dandy tutorial post which made her amazing design look super simple. Seriously, this girl is a genius with nail art, her blueberry nails are freaking spectacular. I cannot figure out how she only used four polishes for that manicure. Anyways, off topic, here's my attempt at her pencil nails! (My camera is still a little funky, working on fixing the color issues). When I started painting, I didn't know what base yellow I should use. I was going to use Julep Daisy, but eh I really dislike that polish. I have owned Sinful Colors Let's Meet for ages now, and it is a beautiful yellow shimmer polish. For the most part, I really enjoy the polish, but it is rather sheer and takes a few coats to show up. In order to not waste polish or have white undies, I grabbed my bottle of Sun Kissed by China Glaze and painted on a base coat. 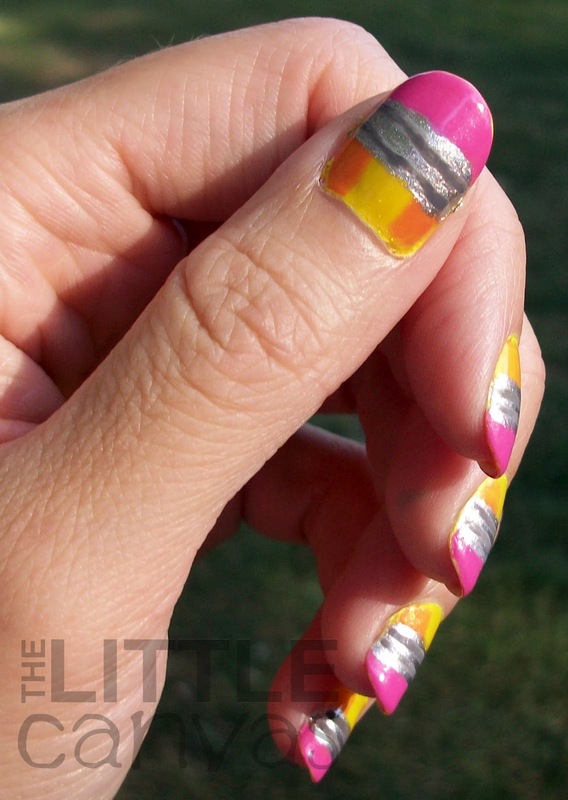 I then used Let's Meet as a sheer top coat, which gave the nails a perfect pencil color. Once dried, I took Zoya Lianne, a gorgeous shimmer orange polish, and brushed the outer edge of the nail to give the nail the 3d pencil look. With Ulta's Flamingo, my pretty pink, I french tipped each of the nails. I did it rather messy because I knew the silver polish was going to cover it up. Pardon my tips in the pictures, they were a little worn down and touched up once prior to photographing thanks to a fantabulous 8 hour work shift. Flamingo though, was seriously the BEST eraser color in the world. With Celeb City, you know the world's most perfect silver metallic polish, I created the metal band of the pencil. I decided to use two thin coats of this because I wanted the silver to really stand out. With my striper and dark gray polish (you know the one with the dirty name), I detailed the silver. Finished with some Out the Door and they were done. I can't begin to say how much I love these nails. They really did make my fingers look like pencils. The one neighbor girl loved them so much, she begged me to paint her nails with them for her first day back to school. Of course she messed up two of the nails before I could photograph them, but they were still cute, trust me. On the difficulty scale, these are a 3! Super simple!!! A little time consuming but nothing bad. 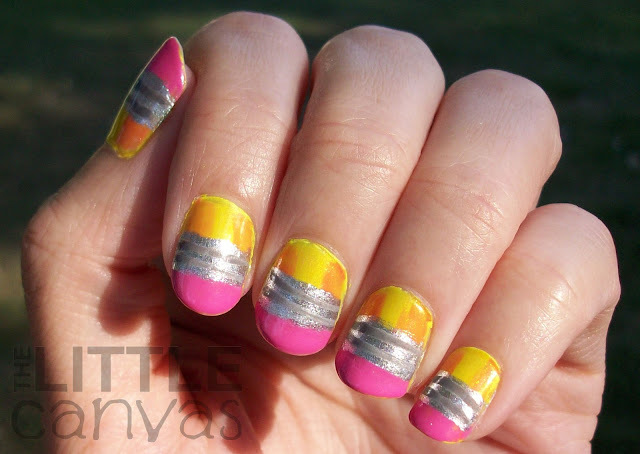 If you don't have any nail art brushes or stripers, then you could easily tooth pick on the details on the metal. Otherwise, it was all done with the regular polish brushes. What do you think? 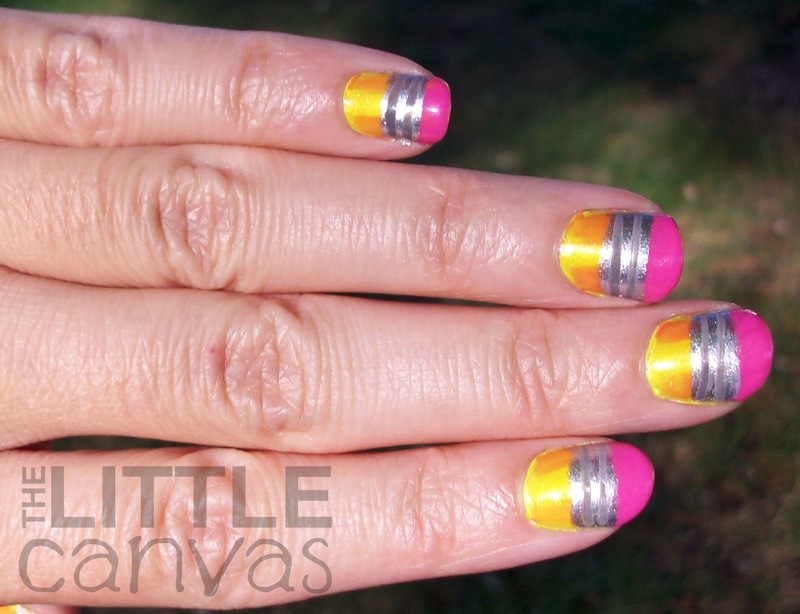 Did you do any special nail art to kick off the school year??? As usual, if you try these out, I want to see!!! Send me a Tweet or post a picture to my Facebook!! Some of my amazing followers have sent me their nail art, and I cannot express how much I love seeing it! You guys all have such talent! Keep the manicures coming!!! This is super cute and you did a great job! I want to try this and the lined paper nil art some day, I hope soon. Maybe to celebrate my graduation in December! Thank you!!! 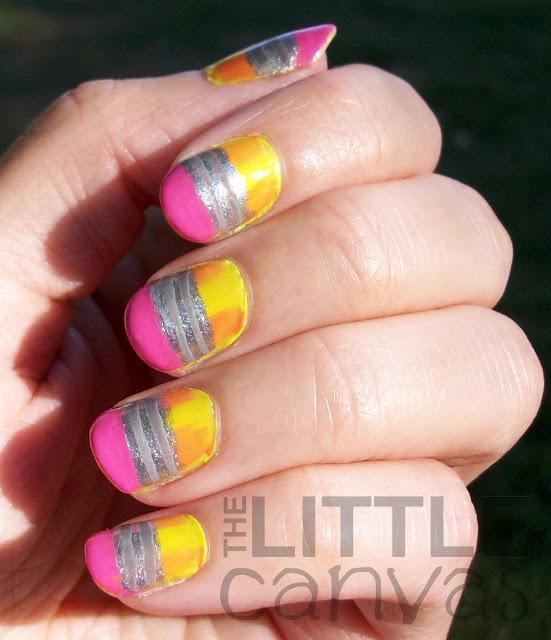 I want to try the lined paper nail art as well!! It's so cute!!! If you do try, I want to see!!!!! Congratulations on graduating in December! That's so exciting!!!! You MUST do them!!!!! It would be perfect! Thank youuu! I liked CutePolish's as well!! I like how some of her nails had the lead end of the pencils! thank you! These look amazeballs!!! So realistic! omg these are ridiculously awesome! These are fantastic! They really do look 3D! Great job!